During our initial swirling, I noticed cranberry and raspberry aromas and Neil found raspberry, berries and spice with a hint of alcohol. I enjoyed the smooth flavor with initial fruit, spice and a flavor that lasted. Neil agreed that the flavor lingered well and identified black cherry with a good spice in the back of the throat. I’ve decided from all these Pinot Noir’s this month that I enjoy one that is complex and smooth with a lingering flavor. When we began tasting the Mozzarella cheese, we described the texture as soft and squishy. I thought it was a little smoky and tangy while Neil could taste the creaminess from the cows milk. It was pretty mild. 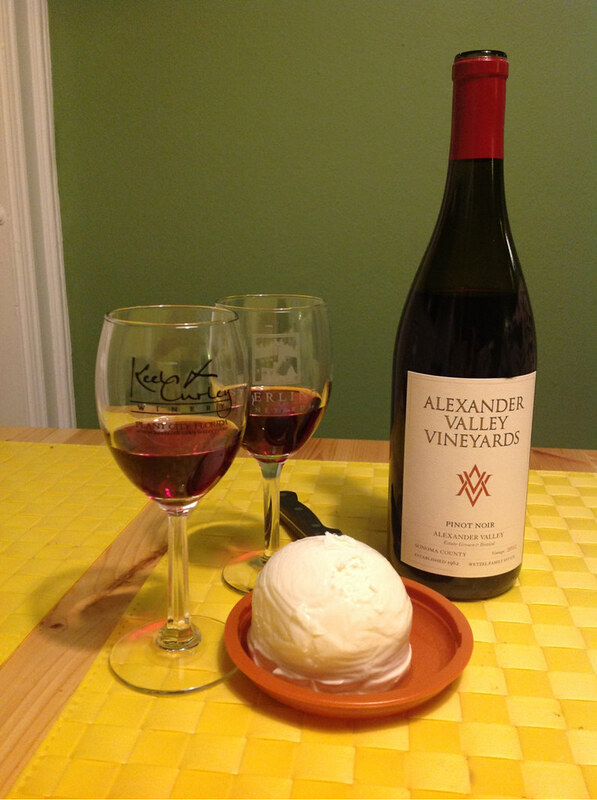 As we combined the Pinot Noir and Mozzarella, Neil found the cheese to get smokier and the wine increased in spice. I didn’t notice much change in the cheese but found the wine to be smooth with spice and vanilla. We discussed how the cheese must have been a little smoky if it got smokier with the wine. During this pairing, in addition to taking notes, we created an audio recording for a future podcast. Stay tuned for our new features!